Spring is finally here. Although the start of spring in the USA officially began on March 20th the winter season would not go quietly. On the East coast, for example, a wintry mix of snow and ice started off the month of April. Now, however, the colder weather truly seems to be behind us as streets are swept clean, motorcycles take to the roads and classic cars come out of storage. During this time of the year there is also a focus by many towns and cities to start spring maintenance on their equipment and vehicles. 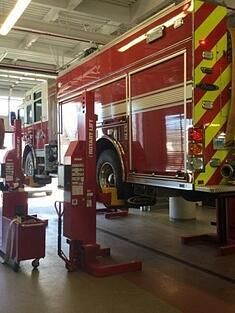 How to perform a preventative maintenance (PM) on a fire truck? When it comes to truck maintenance this time of the year is a good starting point to evaluate the overall condition of a vehicle and perform preventative maintenance (PM). I recently had the opportunity to visit the Branford Connecticut Fire Department and meet with Dan Ghiroli to discuss what is involved when performing a PM on a fire truck. 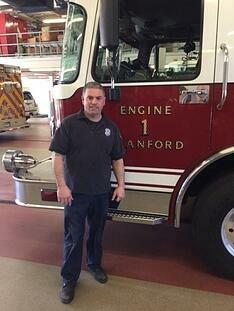 Dan Ghiroli has been a firefighter/paramedic with the town of Branford for 26 years. Over the last 6 years Dan has also added the title of service technician to the list. Like many towns in recent years Branford chose to invest in Dan and an onsite maintenance shop so that routine vehicles services could be done in house saving both time and money. When I arrived Dan had Engine one on the lift. Engine one is a front line fire truck meaning that out of all the trucks in the fleet it sees the most activity. Due to this extensive use preventative maintenance services for this truck are scheduled every 500 hours. Similar to maintenance services on an automobile, all fluids/ filters, belts, and hoses are checked. All grease points on the chassis are lubed and the tires, brake system, and driveline are checked. In addition to this, however, a fire truck will also be put through a pump and ladder test (both aerial and ground) to ensure that everything is working properly. Dan is very diligent when it comes to maintenance and testing. If something needs to be fixed it’s fixed and whatever needs to be replaced is replaced. This is all done in the name of safety. This also holds true for the Onspot automatic snow chain system. The first option is to simply leave the chain system on the vehicle. While this is obviously the easiest of the three options it still requires the chain system to be checked every time the vehicle is brought in for a PM. When servicing the system in this manner the chain wheels need to spin freely with no binding and the chain plates and wheel hubs need to be checked for excessive wear. Next, the arm pivot points and angle joints need to be greased. Finally the system needs to be engaged and disengaged to ensure all parts move freely, the solenoid is working, and the chain wheels are operating at the proper angles. In fact, when choosing to leave the system on year round it needs to be engaged and disengaged at least once a month if not more to keep the system “exercised”. The second option is to remove only the chain wheels from the system. Again although simple in practice this option can go a long way in prolonging the life of the system. 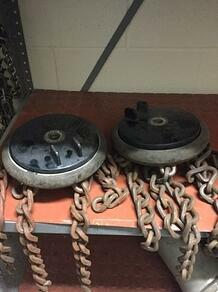 The reason is that when you remove the chain wheels you are not only removing the wheels themselves, but also the 4-5 kilograms of weight associated with the wheels. Removing them will also prolong the life of the wheel bearings. After the chain wheels are off they should be marked with the truck number before putting them on the shelf. Finally, power to the system should be disconnected or the in cab switch should be locked out so that the system is not accidently engaged. The third and by far best option is to remove the chain units altogether leaving only the mounting brackets (attached to the suspension of the truck) in place. This is the option that Dan prefers. 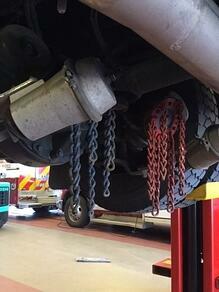 When the chain units are completely off the vehicle it allows for a thorough evaluation of the system. 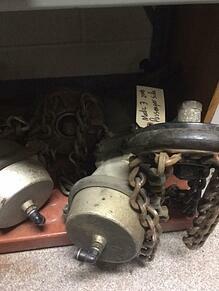 The chain units can be “benched” by placing one side at a time in a vise and putting air to the unit. This allows the system to articulate through its full range of motion all the while checking for any abnormal wear, or erratic movement. At this point any worn parts can be identified and replaced. Best of all once the system is refurbished or found to be acceptable it is placed on a shelf in the shop awaiting the start of the winter season, but for now let’s enjoy spring.